Should You Collect Before Age 66? Last month, we began working with new Relaxing Retirement members (I’ll refer to them as Jim and Linda) who had a host of questions surrounding social security. As I explained to Jim and Linda, there are 2 major factors to consider before collecting social security benefits before your ‘full retirement age’ (see below). Today, I’ll outline the first part of the answer I provided them which is the “penalty” for continuing to work. He was told that there is a penalty for taking his social security benefits if he still earns income from work. Jim’s partially right. There’s a lot of confusion about what those penalties are, so let’s quickly outline the limits. First, when you reach “full retirement age” (social security’s definition of full retirement age is age 66 for 99.9% of those who are reading this), you can earn as much as you want from work (earned income) and still receive your full social security benefits without any reduction in benefits. When Calculating Your Pre-Age 66 Benefits? For social security income calculation purposes, only income you receive from work, whether that income is reported on a W-2 or 1099. Income you receive from pensions, rental property, dividends and interest, and capital gains do not factor into the equation. As Jim is facing right now, the dilemma comes when you want to begin collecting benefits before your ‘full retirement age’. Currently, from age 62 to 65, you lose $1 of social security benefits for every $2 of “earned” income over $15,480 (in 2014). That’s $1,290 per month. So, for example, in Jim’s case, since he’s 63, if he continues to work part-time, and he earned $15,480 from his new part-time job, he can still collect his social security benefit without any reduction in benefits penalty. However, if he earned $27,480 from his part-time job, that’s $12,000 over the limit, so social security would withhold $6,000 (or $500 per month) from his social security benefits (i.e. $1 withheld for every $2 you earn over the limit). When Jim turns 65 in two years, those penalties are reduced between his 65th birthday and his full retirement age (66): he would lose $1 in benefits for every $3 he earns in excess of $3,450 per month. So, if you’re like Jim and you’re planning on still working after you “retire”, you’ll want to consider these limits. An important distinction to note, however, is that you can earn as much as you want during the year you’re going to start collecting. These limits only apply on a monthly basis once you start collecting social security benefits. In Jim’s case, he’s 63 years old this year. If he retires at the end of August, and he’s already earned $136,000 this year through August, the “earnings” litmus test does not apply to the $136,000 he’s already earned in 2014. It only applies during the first month he begins collecting benefits. So, from September through December, he can earn an additional $5,160 ($1,290 x 4 months) and still collect his social security benefits without a reduction in benefits “penalty”. Admittedly, Jim has struggled with his decision on whether to continue working or not. However, his decision was made a whole lot easier when I informed him that his decision wasn’t permanent. If he begins collecting social security and later decides that he’d like to begin working again, he can tell social security to stop sending checks until he wants them started up again. 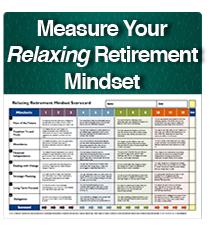 You might find it amusing to note that we have several Relaxing Retirement members who have started and stopped numerous times! Now that we’ve clarified the first half of the equation of when to begin collecting, next week we’re going to tackle the second all important factor.